Develop exam confidence in your students and help them to understand grading criteria with model answers, mark schemes and graded sample answers with examiner comments. This full-colour book includes five full tests in line with the revised Cambridge IGCSE First Language English 2020 syllabus to give your students plenty of opportunity to practise. 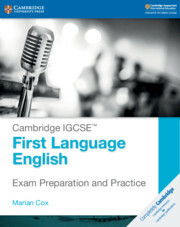 Ideal for use in the final year of the Cambridge IGCSE course and can be used alongside the Cambridge IGCSE First Language English coursebook or any other coursebook.